Cilengitide is a potent integrin inhibitor for αvβ3 receptor and αvβ5 receptor with IC50 of 4.1 nM and 79 nM in cell-free assays, respectively; ~10-fold selectivity against gpIIbIIIa. Phase 2. WT mice were subjected to BDL and treated with either vehicle or cilengitide (10 mg/kg) daily for 6 days; adjacent liver sections were immunostained for CK19 or PCNA. Data were quantified and expressed as mean ± SD. (n = 6 per group.) *P < 0.02, **P < 0.004, Student’s t test. BC, aMPV/B F protein fusogenic activity was determined using syncytium formation and reporter gene assays. RGE peptides (80 μM) were used as the control. A-205804 is a potent and selective inhibitor of E-selectin and ICAM-1 expression with IC50 of 20 nM and 25 nM respectively. The effect of rhICAM-1 or inhibitor A-205804 on hepsin or CtsD transfected MCF-7 cells was detected. The level of E-cadherin, claudin-1, N-cadherin, vimentin and Snail1 was analyzed by western blot. SB273005 is a potent integrin inhibitor with Ki of 1.2 nM and 0.3 nM for αvβ3 receptor and αvβ5 receptor, respectively. Western blot analysis of levels of p-FAK (Tyr397) and total FAK in SK-N-SH cells treated with SB273005 (3 μM) for 6 h and 24 h. One experiment is shown for each cell line. Control cells (treated with diluent, marked as C, were also included). α-tubulin was used as the reference protein. Cyclo (-RGDfK) is a potent and selective αvβ3 integrin inhibitor. Cyclo(RGDyK) is a potent and selective αVβ3 integrin inhibitor with IC50 of 20 nM. (E, F) Inhibition of integrin pathway by integrin inhibitor Cyclo(RGDyK) (30 µM) eliminated the enhancement of ZC3H14 depletion on integrin pathway in HepG2 (E) and MHCC-97L (F) cells. NS, non-specific reactive band. Tirofiban (MK-383) is a selective platelet GPIIb/IIIa antagonist which inhibits platelet aggregation with IC50 of 9 nM. Tirofiban Hydrochloride is the hydrochloride salt form of tirofiban, a selective platelet GPIIb/IIIa antagonist which inhibits platelet aggregation. It is more soluable than Tirofiban. ATN-161 (Ac-PHSCN-NH2) is a novel small peptide antagonist of integrin α5β1. 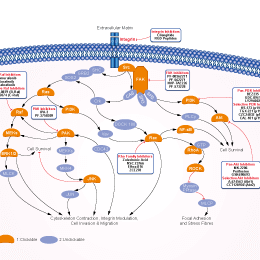 It binds to several integrins, including α5β1 and αvβ3, that play a role in angiogenesis and tumor progression. Lifitegrast is a novel small molecule integrin antagonist that inhibits a specific T cell-mediated inflammatory pathway involved in the pathogenesis of DED. Leukadherin-1 (LA1) is a small molecule agonist that enhances CD11b/CD18-dependent cell adhesion to its ligand ICAM-1(an agonist for the complement receptor 3 (CD11b/CD18)).